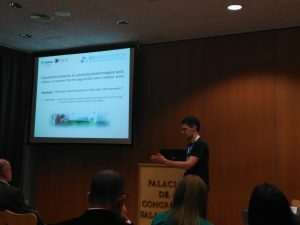 Some LEGE Culture Collection (LEGE CC) team members participated in the congress BioIberoamérica – Biotecnologia Integrando Continentes, held in Salamanca, Spain, on 5 to 8 June, 2016. Vitor Vasconcelos presented the oral communication “Cyanobacteria secondary metabolites with biotechnological applications: toxins, drugs, cosmeceuticals and antifoulings”. Vitor Ramos also presented a communication titled “Cyanobacterial diversity as a promising biotechnological asset: reflection on outcomes from the usage of LEGE Culture Collection’ strains”. These two presentations exposed the cyanobacterial diversity of the LEGE CC, at the same time that showed promising results for the usage of LEGE strains and associated bioproducts in the biotechnology industry. Other research findings involving LEGE CC strains were also presented in three posters, titled: “Testing and improving simple cryopreservation methods for biotechnological-important cyanobacterial strains from a Culture Collection”, “Search for cyanobacterial bioactive compounds towards natural antifouling development” and “The resin diterpenes dehydroabietic and abietic acids are widespread in Cyanobacteria “, which were presented by João Morais, Jorge Antunes and Pedro Leão, respectively.